Datura Herbal Plants. The Datura is a distinctive looking plant with beautiful flowers and prickly fruit funnel capsules. It is found sporadically on fallow land or on roadsides. As poisonous nightshade family of Datura is highly toxic, but also has considerable healing powers that were formerly used for asthma and nervousness. Nowadays, the Datura is no longer medically used because the toxicity is ultimately greater than its healing power. Only in homeopathy the Datura is still occasionally used, because it is harmless in homeopathic potentiation. Attention! Highly poisonous. Datura apply only homeopathy. Previously the Datura has been used as a tincture for asthma and nervousness. Asthma and asthma-cigarettes were offered. Their smoke should allow an easy breathing. Externally were Datura leaves that have been soaked in hot water, put on painful inflamed joints, eg rheumatism. Also Stechapfeltinktur was rubbed against rheumatic complaints. Meanwhile, the Datura but is no longer used in herbal medicine, because it is too toxic. The homeopathic medicine Datura is preferably applied in the potencies D4 to D6. Man there are at particularly strong agitation, as well as before the tincture, in asthma, whooping cough and neuralgic diseases. The active ingredients of the datura ease breathing in asthma, because they expand the bronchi. In addition, the Datura has a calming effect, which is why he was formerly used against nervousness. Furthermore, the Datura is highly painkilling. Although the Datura is highly toxic, it is rare to accidental poisonings. The appearance of the datura not tempted to "snacking". However, if it comes to eienr poisoning, this is mostly milder than in poisoning by belladonna. It comes to sore throat, dry mouth, blurred vision, and restlessness. In severe cases, it can also lead to paralysis, hallucinations and hallucinations. In very severe cases, datura poisoning also lead to death. Misuse of the datura may cause dependence. Contact with skin can cause skin irritation in sensitive people. In a Datura poisoning can drink strong black coffee or strong oak bark tea as an antidote. Of course you should also see a doctor urgently. Since the Datura is originally native to the Americas, he was there also first used for magical purposes, long before the datura in Europe emerged. For the Aztecs the Datura was a sacred plant. Once the datura in Europe was at home, you took him here for magical purposes. A popular application is the magic resolution of curses. Existing curses shall be reversed using the datura. These plant parts are scattered in the house of the victim's curse. The Datura to protect against evil spirits and insomnia. Probably the Datura came only in the 16th century over southern Russia to Europe. Therefore, he was not known in classical antiquity and was therefore also not then used as a medicinal plant ..
After its introduction in Europe of Datura has been used primarily as a home remedy and for magical purposes. Only in the 18th century it was first officially used by doctors as a drug. The Viennese physician of Stoerck made the Datura is known as a drug. In the aftermath Datura tincture or extract for asthma, spasmodic cough and restlessness were administered. Anti-asthmatic cigarettes from the leaves should ease breathing in asthma. They were still a long way like smoke into the 20th century. Datura is originally from Mexico, but he is now at home in Europe. It prefers to grow on dry but rich soils and in sunny or partially shaded locations. Therefore, sometimes it can be found on dumps, in the Barrens and on roadsides. The annual plant is up to 100 centimeters high, as long as the location is convenient. In the floor protrudes a long taproot. The bare stems branch out gift annoying. The green leaves are ovate, pointed to run forward and consist of several pointed lobes. Your margin is coarsely toothed or sinuate. The white to pale purple flowers appear from June to October in the axils of the stem. They are funnel-shaped, have five lobes and open only in the evening. They are up to 8 cm long. Her scent is heavy and cloying. The leaves and stems, however, smell rather unpleasant; Your scent is somewhat reminiscent of chickpeas. From the Datura flowers are spiky seedpods develop. This seedpods owe the Datura the name. The seed pods are first green and fleshy. They stand vertically upwards in the stem axils. The capsules are up to 4 cm long. When ripe, the seed pods are brown and dry. They open, so you can see the many tiny black seeds that are located in the four chambers of the capsule. The domestic Datura has numerous relatives worldwide. In India and other Asian countries grows the Indian Datura. The plants are often larger than that of the European Datura. The leaves are not lobed and toothed, but have a rounded egg shape with a tip at the end. The flowers are very beautiful and decorative. The nodding datura (also: Datura Inoxia) is native to Central America, is in the Mediterranean and in the Canary Islands but often neglected before. It is often larger than the European Datura. His white or light purple flowers are slightly larger (up to 20 cm long). Unlike the European Datura capsule fruits are not up, but hanging down as if they were nodding. The cultivation of datura is relatively simple. He needs rich soil and a sunny site at least half. One can Preculturing the seeds in small cultivation pots before auspflanzt the young plants in late spring in the open land. The distance between two plants should be at least 70 cm. The Datura plants grow fast if they feel comfortable at the site. 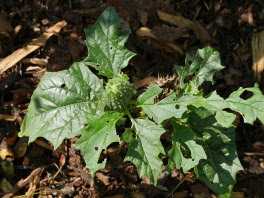 In gardens with children no datura should be planted due to toxicity. 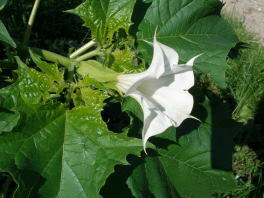 Because of the toxicity of the datura should harvest or collect any of its parts for medical use.